Researchers and observers have long recognized that birds and various other flying creatures change the positioning of their body structures in flight in order to perform specific maneuvers or adjust their aerodynamic profile to accommodate changing flight conditions. This adaptive orientation of body shape has been dubbed “morphing” in the popular literature. The words “morph” and “morphing” are actually digressive forms of the word “metamorphosis,” which derives from the Greek “meta” (to change) and “morfe” (form). This is an apt description of the ability that birds possess to change the form or geometry of their bodies for increased maneuverability, as well as for stable flight in a wide variety of ambient conditions. This eagle is pulling its feet against its body to reduce aerodynamic drag. Note also the craning of the wings (normally used to slow descent speed) and the spreading of the wing feathers to break up wing tips vortices that increase drag. My observation of the flight of buzzards leads one to believe that they regain their lateral stability when partly overturned by a gust of wind, by a torsion of the tips of the wings (Wright, 1900, Image 4). Consequently, the Wright brothers designed their first aircraft to be able to “twist” its wings for lateral stability and control, mimicking bird capability. Another well-known example of morphing in aircraft design is retractable landing gear which serves the same purpose for aircraft as when a bird pulls its feet up to its body in flight. That is, this type of morphing dramatically decreases aerodynamic drag which, in turn, increases energy efficiency for the bird of prey—which translates to fuel efficiency in aircraft. Additional “low-tech” examples of morphing include movable control surfaces used to impart forces and torques on the aircraft for maneuvering and stability, wing “slats,” “slots,” and “flaps” that extend to change the shape of the wing, providing higher lift at lower speeds for takeoff and landing, and variable “sweep” wings that allow aircraft to fly efficiently at dramatically differing flight speeds, such as in transitioning from subsonic to supersonic flight. In contrast with these examples of “low tech” morphing designs of the past, a morphing aircraft has been defined as “one that utilizes innovative actuators, effectors, or mechanisms to adapt its state substantially in order to enhance behavior and performance in addressing multiple environments” (Love, et al., 2007, emp. added). These past examples of morphing technologies were certainly innovative in their time, but are now fairly commonplace—not even considered “morphing” by some. NASA will open the door to a bold and revolutionary era by using technology to mimic nature. The seemingly effortless flight of birds provides the inspiration for new aircraft utilizing wings that reconfigure in flight. The vehicle changes—or morphs—from a low-speed configuration to one more suited for high speed (as quoted in Levine, 2001). Despite the past century of innovation in aircraft technology, the versatility of modern aircraft remains far worse than airborne biological counterparts. The shape changing accomplished by birds and bats in flight stands as one of the few examples of true morphing. As such, the aircraft community is devoting considerable attention to the study of biological systems and how they might be implemented on a flight vehicle (Abdulrahim, 2005, emp. added). Clearly, research in aircraft technology and design continues to draw ideas and inspiration from nature’s flyers. It is also clear that our technical capabilities seriously lag behind their natural abilities. Morphing technology development requires integrated research in materials, smart structures, multi-functional airframe, and adaptive control. It is necessary to evaluate these constitutive technologies in a morphing vehicle to establish requirements and assure readiness for technology implementation (Love, et al., 2007). Another research team, funded by the Air Force Research Laboratory (AFRL) and Northrup Grumman, further stated: “Significant design challenges require advances in smart structures and materials (skins), actuation and power distribution, and feedback control of the morphing structure” (Ghandi, et al., 2007). The implication here is that morphing design is highly multi-disciplinary (structures, aerodynamics, control, etc.) and that all of these areas require additional research before the technology readiness level will be sufficient to actually build a true morphing aircraft. These examples only scratch the surface of the extreme levels of government funding and human resources that have gone into morphing aircraft research, yet there is still much work that must be done before a viable design can be realized, mainly due to the multi-disciplinary nature of the problem. This provides a cautionary note for those pursuing biomimicry, direct replication of biological features: essential aspects of those biological features may be driven by secondary characteristics or functions unrelated to the features’ primary functions. The bat wing, with all of its elegant modifications for flight, is an obvious example. It is derived from a typical vertebrate forelimb with all of the associated musculature, skeletal, and neuronal architectural characteristics that were originally developed for terrestrial or aboreal locomotion. That is, it was not designed for propulsive flight a priori as an engineered device might be, but was modified from other structures that originated for other functions (Evers, 2007, p. 10). Dr. Evers issued a warning here to all those engaged in morphing aircraft research that are proceeding from the perspective of biomimicry (copying nature)—that they may be in fact designing structures that are not optimally suited to their purpose because they are copying from organic structures that, presumably, were not designed for the purpose they serve. Note, however, that Dr. Evers states that the bat wing was “modified from other structures that originated for other functions” (p. 10, emp. added). One might wonder how the bat wing “was not designed for propulsive flight a priori,” but the “typical vertebrate forelimb,” from which it supposedly derived, “originated for other functions.” This type of “doublespeak” is not uncommon, however, in Darwinist writings, and it belies an underlying difficulty with Darwinian thought. Nature’s machines are so good at what they do that it is difficult for even die-hard Darwinists to accept that they all arose as a result of an undirected process even while arguing that they did. Flying creatures and machines must be able to detect or sense the condition of the atmosphere around them, as well as their own position and structural configuration, in order to be able to carry out the activity of flying in a given environment. Examples of the types of data that must be gathered include air speed, altitude, air pressure, position relative to other objects, and the position and shape of their wings at each moment (especially true if morphing is being employed). This capability can involve highly specialized sensors in aircraft such as angular rate gyros for measuring orientation, and ports along the wing for measuring air pressure. Flying animals are able to make use of typical animal sensing capabilities such as vision, hearing, and smell, but must also rely on some very special sensor systems. Examples of these special sensors in animals include echo-location in bats (Colley, 2004), a bird’s ability to sense linear and angular acceleration with its ears (Pennycuick, 2008, p. 307), and highly sensitive hair-like mechanoreceptors that allow insects to sense the approach of potential predators (Vaidyanathan, et.al., 2001). It has even been suggested, in recent research, that birds can sense the magnetic field of the Earth, providing valuable information for navigation (Brahic, 2008). The sensor inputs from eyes, ears, etc., as well as specialized sensor systems, must be integrated and processed in the brain for biological flyers, or alternatively, the flight computer if one is considering the sensor systems of flying machines. The processing that must be carried out includes specialized algorithms for flight stability, guidance, navigation, and control. Flight stability is arguably the most important of these functions, since without stability it is impossible to remain in flight, and lack of stability in flying can easily lead to tragic results. In aircraft, flight stability algorithms are executed at the highest possible processing speeds and given top priority for processor usage. Guidance is the function that determines, to the highest possible accuracy, where the flyer is currently located, particularly with respect to where it needs to go. On the other hand, navigation compares guidance information with known geographical waypoints to compute the “best” course for the flyer to follow to end up where the guidance function wants it to go. The control function takes guidance and navigation information and generates commands for the actuation system to steer the flyer along the computed course. In biological flyers, these commands are electrical impulses from the brain that stimulate specific muscles and organs. In aircraft, the commands are also electrical signals that activate electric motors or trigger hydraulic actuation. Given the computational requirements of flight locomotion, it may not be surprising that the size of a bird’s brain with respect to its body size is, on average, 10 times that of the reptiles with whom they are assumed to share common ancestry (Jerison, 2004). The wing craning (gull-wing) mechanism is loosely modeled after a set of parallel bones connecting the shoulder and elbow joints of a bird wing. A rotation of the shoulder joint in the vertical plane results in an extension or contraction of the entire wing. The skeletal mechanism provides a geometric ratio between the extension of the inner and outer bones. Such a mechanism allows the bird to morph into a variety of positions using a single movement. Each of the positions is largely stable and affords a unique capability within the flight envelope (2005). The specialization of this “skeletal mechanism” for morphing flight is clearly illustrated in this narrative, and the muscles that actuate these motions would be expected also to be specialized for the task in their attachments to the skeletal structure, as well as their configuration. So, each of these “subsystems” require specialized components to fulfill their part in enabling the wonders of morphing flight. The manner in which these subsystems interact, however, is equally critical to the success of morphing in providing a positive contribution to flight capability. The sensory outputs have to provide specific information to be useful for stability, guidance and navigation, and the computational capability has to have sufficient processing capacity and be “wired” in such a way as to operate effectively on that information. Similarly, the computation function has to possess information about actuator configuration and dynamics in order to output appropriate command signals to achieve the objective of flight stability and to successfully execute the desired motion in flight. Finally, the actuators have to possess the dynamic range, as well as force and torque magnitudes, to achieve the necessary changes in body shape and position in a timely fashion. Multiple components of bird anatomy have been studied in the literature with respect to the irreducible complexity they possess regarding the bird’s ability to fly. For example, Matthew Vanhorn discussed the amazing complexity of bird feathers (Vanhorn, 2004), Caleb Colley pointed out how bats use their ears (hearing) for echolocation (2004), and irreducible complexity has been examined in general terms with regard to various components of bird physiology (Fausz, 2008). These discussions of the various elements of bird physiology are compelling irreducible complexity arguments when one considers the specialized requirements of flight systems (cf. Miller, 2006, 5:5-R). This block diagram illustrates the interconnection and interdependence of the major subsystems involved in achieving advanced flight capability. When these physical components are considered in a system context, however, the arguments of irreducible complexity are taken to a whole new level. 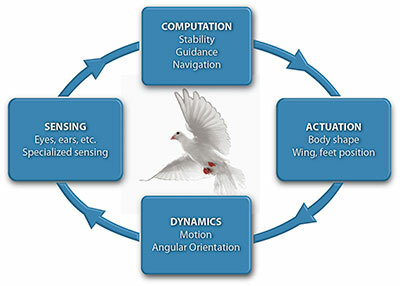 As discussed, the bird’s brain must have sufficient capacity to carry out the required computations, but this capacity is useless for flight without the required sensor information or the appropriate actuation systems for carrying out the computed commands. Likewise, without the necessary brain capacity the specialized sensing and actuation components would serve no purpose, and would likely be detrimental to survival. Useful flight capability is not possible without flight stability, at a minimum, and this is only possible if the necessary sensor, computer, and actuator components are all in place. Indeed, attempting flight without stability will, with high probability, result in the death of the flyer. To lay the foundation for a truly multi-role aircraft, multidisciplinary research efforts are currently focusing on technologies that enable substantial changes to the wing configuration.... Aerodynamics analysis [sic] (including unsteady and transient aerodynamics) are also important to accurately characterize the vehicle for control surface sizing, engine compatibility, and flight-control design. Despite significant strides to develop wing structure and actuation systems, much work remains to effectively control both the morphing planform as well as the entire morphing aircraft (Ghandi, et al., 2007). This discussion illustrates that, even in focused research, it is difficult to make sure that all aspects of a significant multi-disciplinary problem are given adequate attention. This is no less true when it comes to biological creatures capable of morphing flight. command, and make its nest on high? eyes observe from afar (Job 39:26-29). Here God describes the computational capability inherent in a hawk flying by “wisdom” and an eagle by “command.” He also indicates the tremendous acuity of the eagle’s eyes for sensing prey, as well as several other facts about the behavior of these birds. Truly, only an omniscient, omnipotent God would possess this knowledge and the ability to apply it in such wondrous works of design and creation. Few birds have more impressive morphing flight capability than birds of prey, such as hawks and eagles, making them perfect examples of the amazing design ability of the Creator. Abdulrahim, Mujahid (2005), “Flight Performance Characteristics of a Biologically-Inspired Morphing Aircraft,” 43rd AIAA Aerospace Sciences Meeting and Exhibit, January 10-13, Reno, NV. Brahic, Catherine (2008), “Birds Can ‘See’ the Earth’s Magnetic Field,” New Scientist, [On-line], URL: http://www.newscientist.com/article/dn13811-birds-can-see-the-earths-magnetic-field.html. Colley, Caleb (2004), “Bat ‘Vision’,” Apologetics Press, [On-line], URL: http://www.apologeticspress.org/articles/2633. Evers, J.H. (2007), “Biological Inspiration for Agile Autonomous Air Vehicles,” Platform Innovations and System Integration for Unmanned Air, Land and Sea Vehicles (AVT-SCI Joint Symposium). Meeting Proceedings RTO-MP-AVT-146, Paper 15: 1-14. Neuilly-sur-Seine, France: RTO, [On-line], URL: http://www.rto.nato.int/abstracts.asp. Fausz, Jerry (2008), “Designed to Fly,” Reason and Revelation, 28:9-15, February, [On-line], URL: http://www.apologeticspress.org/articles/3599. Ghandi, N., Jha, A., Monaco, J., Seigler, T.M., Ward, D. and Inman, D.J. (2007), “Intelligent Control of a Morphing Aircraft,” 48th AIAA/ASME/ASCE/AHS/ASC Structures, Structural Dynamics, and Materials Conference, April 23-26, Honolulu, Hawaii. Jerison, Harry J. (2004), “Dinosaur Brains,” Encyclopedia of Neuroscience (CDROM: Elsevier), third edition. 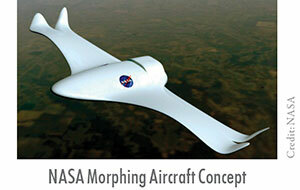 Levine, Jay (2001), “The Morphing Aircraft,” The Dryden X-Press, NASA Dryden Flight Research Center, [On-line], URL: http://www.dfrc.nasa.gov/Newsroom/X-Press/stories/043001/new_morph.html. Love, M.H., Zink, P.S., Stroud, R.L., Bye, D.R., Rizk, S. and White, D. (2007), “Demonstration of Morphing Technology through Ground and Wind Tunnel Tests,” 48th AIAA/ASME/ASCE/AHS/ASC Structures, Structural Dynamics, and Materials Conference, April 23-26, Honolulu, Hawaii. Miller, Dave (2006), “Bee Flight Physics,” Reason & Revelation, 5:5-R, February, [On-line], URL: http://www.apologeticspress.org/articles/2839. Pennycuick, Colin J. (2008), Modelling the Flying Bird (San Diego, CA: Academic Press), first edition. Simonite, Tom (2008), “Morphing Aircraft Mimics a Bird on the Wing,” New Scientist, March 6, [On-line], URL: http://www.newscientist.com/article/dn13419-morphing-aircraft-mimics-a-bird-on-the-wing.html. Vaidyanathan, Ravi, Roger D. Quinn, Roy E. Ritzmann, and Troy S. Prince (2001), “An Insect-Inspired Endgame Targeting Reflex for Autonomous Munitions,” International Conference on Intelligence Robots and Systems, October, 2001, Wailea, Hawaii. Vanhorn, Matthew (2004), “Words of a Feather,” Apologetics Press, [On-line], URL: http://www.apologeticspress.org/articles/2610. Wright, Wilbur (1900), “Letter to Octave Chanute,” The Wilbur and Orville Wright Papers, May 13, Library of Congress, [On-line], URL: http://tinyurl.com/ybropwa.